But every once in a while, something happens that makes me stand up and take notice in the print world. 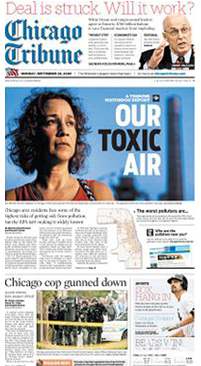 The Chicago Tribune just launched a redesign, and it’s different — very different. I like it. Huge, huge type, lots of graphics, engaging look. Hope to pick up a physical copy sooner than later. Rumor has it, the Los Angeles Times is next, and it’s never going to be the same. Here’s why: No matter how we slice and dice it, all media influences each other. Radio influences the web on how advertisements are structured for pod casts. Magazine and newspaper style design is making a big comeback in blogs. Newspapers are shifting to more magazine style design. And Magazines look to the web for greatness. We should stay firmly in the physical world so we can adapt it the virtual one.